Congratulations to Ptl. 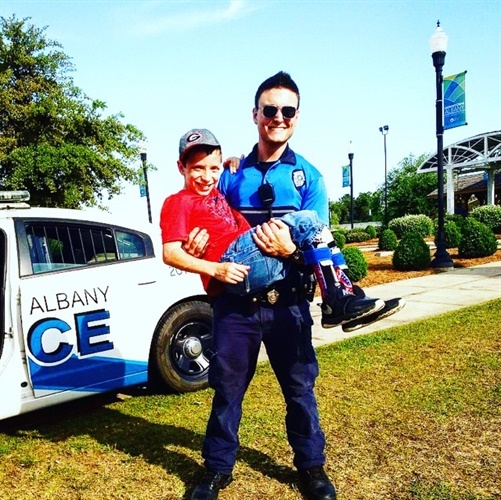 Travis Goodson of the Albany (GA) Police Department for being named the POLICE Magazine’s HAIX® Hero of the Month for July! Goodson was nominated by his supervisor who says, “Ptl. Travis Goodson is very passionate about the City of Albany becoming one community." Goodson has organized and coordinated a number of community initiatives during his four years on the force. For example, Goodson led dozens of citizen volunteers who painted the shutters on the McIntosh Homes housing area, cleaned up the grounds, and cooked food. Goodson also started a #HUGACOP campaign that went viral. Goodson was chosen as the winner through the support of visitors to the POLICE Magazine Facebook page. He will receive a free pair of HAIX® boots as his prize. We want to thank everyone who submitted a nomination and/or voted in the HAIX® Hero of the Month campaign. Keep an eye out for the next HAIX® Hero of the Month contest coming up in October.